Most of the reviewers valued the comfort of the Prism v2. The stability is noticeable without being intrusive, according to several runners. It is more breathable than the original model, based on the comments of a handful of testers. The toe box gets a little more room with the removal of the forefoot/toe box overlays. A few experts appreciated the softer heel, which does not compromise the secure fit of the rear section. It comes in multiple color options. New Balance continues to offer wide widths for the Vazee Prism v2. The price is less compared to some of its competitors. It rides a bit softer, which a handful considered as an improvement over the stiff ride of the earlier version. Some runners have used it for gym workouts because of the lightweight support. It is noticeably heavier than the original model, according to a handful of reviewers. The midsole foam lacks the responsiveness of many of its competitors, according to a few runners. The 2nd instalment of the Prism continues to provide the only stability option in New Balance’s Vazee collection of shoes. It is a shoe that still performs a little faster despite the added bulk. Additionally, it becomes a more viable option for those who require lightweight stability when running in half or full marathons. With a very reasonable price tag, the shoe is an excellent value for the money choice for many runners. How good is version 2 of the New Balance Vazee Prism? The New Balance Vazee Prism v2 is a thing of beauty in terms of artistic design. Is it a thing of joy when it comes to covering miles in the urban jungle? See the verdict below. When I first saw the New Balance Vazee Prism v2 in a running store, I was shocked to see that the deep forefoot groove found in the original version of this shoe and the Vazee Pace was gone. But a saleswoman responded, “Yeah, but just look at how much blown rubber takes its place!” She was right, there are four large blown rubber pads in the forefoot, and New Balance dares you to complain about it. Not a chance. The current version of the Vazee Prism trainer weighs 10 ounces, has an 8mm heel drop, is semi-curved, and has a medial post to assist both mild and moderate pronators. It is said to have a medium fit, but I found it to be snug; therefore, I ordered a full size up pair from Zappos. The fit is wide up front - giving the toes plenty of room in which to splay away and pleasantly form-fitting in the midfoot. Oftentimes a support shoe – even those intended for mild pronators – will come with a high-arched insole meant to compensate for flat feet or low arches. This can become a source of irritation, something often noted in online comments. That’s not the case here. The Vazee Prism’s insole is not overbuilt, and one never feels it rubbing against the arch. On the road, the Vazee Prism feels heavier than its listed weight, but this is not a problem in a trainer. In terms of road feel it brings to mind a 90s-era training shoe. Surprisingly, for a shoe intended to be used by heel strikers, the heel landing is quite soft. A harder rubber heel might inspire more confident heel plants, but this is just one runner’s opinion. Despite the perceived weight, there’s no problem in running fast in the Vazee Prism. The shoe feels faster on asphalt than on concrete. Wait, you might say, isn’t this universally true for running shoes? Not necessarily as overly bouncy shoes can produce wasted vertical movement on asphalt and rubberized tracks, resulting in wasted energy. While providing great cushioning, the Vazee Prism allows one to stay close to the ground. In this, it reminded me of triathlon shoes I’ve run in. Keeping one’s feet horizontal to city surfaces can be a good thing. I typically find that taking daily runs and walks in a new model running shoe leads to subsequent muscle aches and twinges as the body adjusts to the shoe. Not to worry with the Vazee Prism’s REVlite midsole. REVlite is both extremely protective and forgiving. This means that the soreness once thought to be an inevitable result of putting in many miles in a training shoe is almost nonexistent. The cushioning and smooth comfort experienced in the Vazee Prism’s ride seems to improve with use. This is, quite clearly, a well built and durable shoe. It’s a luxury in my case to own both the Vazee Prism and the original version of the Vazee Pace. They are like two different but positive sides of the same coin. The Vazee Pace offers a smooth ride but with more flexibility. The Vazee Prism is smooth but bends toward more stability and protection. To use an automobile analogy, the Vazee Prism is a VW Golf with electronic stability control (ESC) turned on; the Vazee Pace is the Golf with the ESC button set to off. The New Balance Vazee Prism v2 is a fine urban trainer for those who need some stability assistance. The $100 list price is extremely reasonable for a well-built, protective shoe upon which New Balance has slathered tons of blown rubber. This is a model that will perform well for distances from 5Ks up to marathons. For many mild to moderate pronators, this might serve as the perfect shoe in which to run a first half-marathon. The New Balance Vazee Prism v2 is another home run from New Balance’s Vazee line. It is equal parts fast and supportive. The New Balance Vazee Prism V2 is a great all-around shoe and I love that I have it in my arsenal. Seemingly, many of the updates in the New Balance Vazee Prism v2 are in response to past issues of the original Prism. Most conspicuous in the changes in the upper is the use of a very breathable and softer mesh. The large holes in the forefoot and the sides guarantees a sweat-free and dry run. The soft, but dense mesh also helps with the form-fitting upper. It plays tag team with the bootie construction for a personalized fit that many runners should find very nice. A little more room in the toe box is answered by the removal of the substantial forefoot to toe box overlays. There should be more vertical space in this shoe than the prior version. The previously stiffer ride is answered by a larger cut out in the outsole. This gives the shoe more compression, particularly for those who land on their heels. This kind of improvement is also manifested in the side walls of both the medial and lateral sides. There are perforations or dimples in most parts of the side walls for a bit more flex and a softer ride. New Balance also made some considerable changes in the forefoot section of the outsole. There are more prominent podular rubber pods that increase softness and the smoothness of the ride. As there are huge podular pods, this create cut outs for enhanced flexibility. The fit of the Vazee Prism v2 is somewhat similar to the original. One can notice that the upper has more room in the toe box and a more form-fitting fit. There are overlays on both sides to hold the foot well. The external heel counter may have been removed, but there is still sufficient support and security for neutrals and mild over pronators. It generally runs true to size. Most of the outsole of the New Balance Prism v2 is composed of blown rubber for more traction. Only the heel section sports a harder carbon rubber to give the shoe a long-lasting performance. There are podular pods in the forefoot in answering the call for a smoother and softer ride. The resulting grooves should only improve the shoe’s flexibility. New Balance remains to be steadfast in the choice of the REVlite foam as the midsole technology for the Vazee line. This foam is supposedly 30% lighter than the basic New Balance midsole foams. It has ample durability with a decent amount of cushioning and responsiveness. 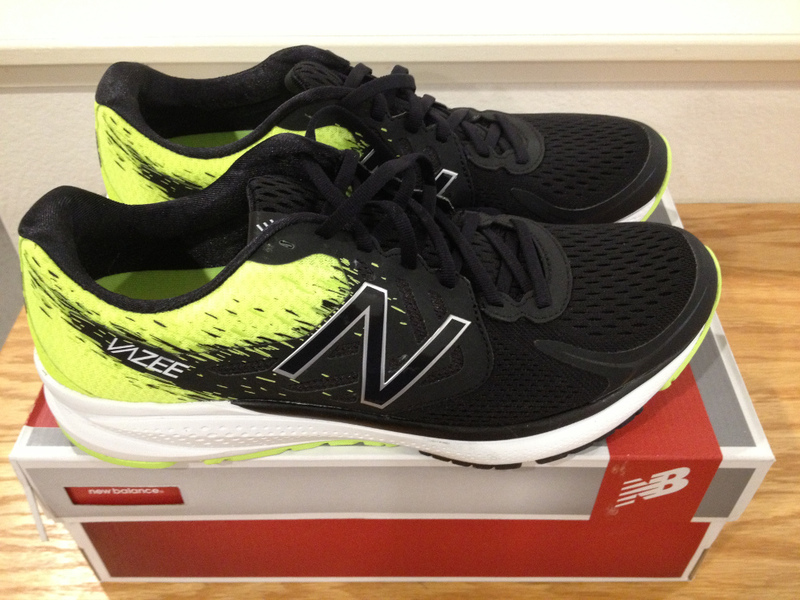 The REVlite foam is also utilized in the NB 1500 v5 running shoe. In order to add more compression for a softer ride, the lateral and medial sides of the foot are covered with small perforations. A co-molded post on the medial side, beneath the arch deliver lightweight stability for minimal overpronators. Superb breathability arrives in the 2nd version of the Vazee Prism because of the large holes of the soft mesh. There are strategically placed overlays for midfoot security. New Balance uses a very plush lining in the interior and a bootie construction for exceptional comfort. An internal, pliable heel counter with a tab of overlay keep the rear section secured and supported. For those who may require orthotics, the removable insole should be an excellent feature. A traditional lace-up closure holds the fit from the first stride until the last.